Modern and forward-looking approaches to education and learning no longer treat learners as passive recipients of knowledge. Rather, they claim to nurture self-monitored and selfdisciplined thinkers who are shown to be academically successful and promising. 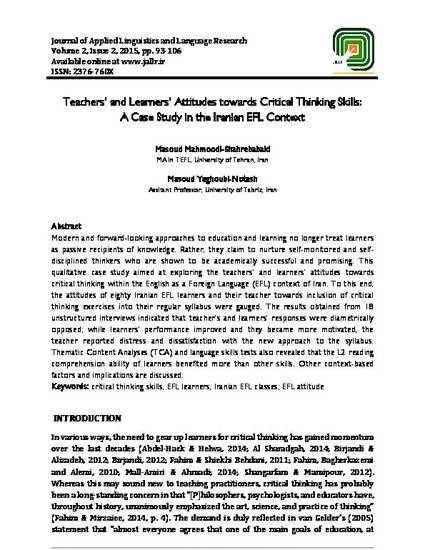 This qualitative case study aimed at exploring the teachers’ and learners’ attitudes towards critical thinking within the English as a Foreign Language (EFL) context of Iran.  To this end, the attitudes of eighty Iranian EFL learners and their teacher towards inclusion of critical thinking exercises into their regular syllabus were gauged. The results obtained from 18 unstructured interviews indicated that teacher’s and learners’ responses were diametrically opposed; while learners’ performance improved and they became more motivated, the teacher reported distress and dissatisfaction with the new approach to the syllabus. Thematic Content Analyses (TCA) and language skills tests also revealed that the L2 reading comprehension ability of learners benefited more than other skills. Other context-based factors and implications are discussed.